Patty is doing good. She is still experiencing some muscle soreness related to the surgery but for the most part is doing well. She has begun to notice some hair loss but not anything major...yet. I was reading up on breast cancer the other day, what's new, heh?, and came across something that I was not aware. Everybody is familiar I'm sure with Rick Warren, the founding pastor of Saddleback Church and author of "The Purpose Driven..." series. But I wasn't familiar with his wife, Kay. She was actually diagnosed with breast cancer herself in 2003. I came across a great article with her about her battle with breast cancer and am posting it HERE for everyone to read. I'd love a chance to get to talk with him about how he, Rick Warren, renowned evangelist and husband, dealt mentally and spiritually with his wife's diagnosis. I'm not a huge fan of his actually. No particular reason. I haven't read his book. I've got it, but haven't read it. Of course, I've got more books I haven't read then one's I have. For some reason, I've always been a little leery of pastor's who have a huge best seller and then turn it into every possible item for sale possible ala, The Prayer of Jabez. Don't get me wrong, I'm not critiquing his book as I haven't read it. Anyway it would be interesting to know how an influential man of God handled similar circumstances. Hair, the Lack of It, and Dog Spit. What a Combination! I apologize for not updating the site very frequently this week. Its been hectic. We had a meeting with the Oncologist on Monday about his desire to change Patty's treatment course which, for us was unexpected. It's a long story as to why but basically after further researching he thinks we ought to change. We have the option to stay on the current course if we desire. So needless to say, Patty did not get her Herception shot this week. If we decide to change, the Herceptin will be delayed until the main chemotherapy is completed. Her treatment course will be extended for several months as well if it is changed. I will update more on this possible change in a later post. Patty has been feeling pretty good this week. She did have a headache this morning. We're still waiting on her hair to begin falling out. I'm dreading it as I know she is. Although, she hasn't mentioned it. I lost mine over years and had trouble dealing with it so I can only imagine how she will do losing it in a few days. Of course, I tell her that she is one up on me as hers will come back! Mine won't. Unless, I run down to Hair Club for Men for a few corn rows. The biggest fear is the fear of the how she'll react, how the kids will react, and how I will react. Actually, I don't think I'll mind it as we'll be able to get places quicker, save money on hair products, and I was thinking to see if she wanted to get a tattoo because now was the time because nobody would ever know she had it once her hair grew back. Ok, I'm joking, please withhold any flaming comments you were getting ready to type. There is some research out there that has got me thinking of getting a dog. All of you know how much Patty loves dogs. Evidently, dog spit is the new hair restoration rage. I figured Patty and I both could put it to good use together! Enough hair. I heard a sermon on the radio the other day that really hit home with me about prayer, persistent prayer. In the sermon, the pastor was discussing the parable of the midnight visitor, Luke 11: 1-13. This is not the easiest of parables to understand. The man didn't want to give the friend bread for the friend's visitor because his door was locked and his family was asleep. But through persistent requests, the man gave his friend the bread. Now be careful and don't confuse God with the man reluctant to give bread because Jesus pointed out that even all of us who are evil know how to give good gifts to our children. He then states, how much more will God, who is without evil, give to His children who ask? The emphasis in the parable was persistence. Persistence in your requests to the Lord. When you pray, pray persistently. Another aspect of the parable is intercession. The friend who went to request the bread did so at his own cost. An unexpected visitor, at midnight, who was hungry. He was probably asleep as well but, he arose and sought food for his friend. He interceded on his behalf at the cost of sleep, time, and begging for food that wasn't even for him. When you are praying for someone else you are interceding on their behalf. Doing that comes at a cost. For most of us, that cost is time. Often, we tell someone that we're praying for them. And when we do, we have full intentions of doing so. But are we? I hope that you are. There is no greater thing you could do for someone then to actually take time to intercede in prayer on their behalf. Many people have told Patty and I they wish there was something they could do for us. I tell them the best thing they could do is pray, on our behalf. Patty felt much better over the weekend. Most of the flu like symptoms had resided. The biggest issue over the weekend continued to be her right arm and the pain sensations that shoot up and down it. This is probably some of the nerves healing. She is also having some mild chest pains that are probably related to the surgery. Patty even wanted to venture up to Dollywood on Saturday. I wasn't as enthusiastic. Of course, I usually never am, lol... But I had different reasons this time. I had so much to do around the house, mow the yard, go to the dump, etc. Katie had homework and violin practice as well. Plus, Patty really doesn't need to be around people that could give her a cold, etc. due to her low white blood counts that make her much more susceptible to infections that could cause her problems. Jay and Laverne had asked if we wanted to travel up to Dollywood with them and I think Patty was pumped to get out of the house. So when I told her that I didn't think it was a good idea due to the aforementioned items above, I could tell that wasn't the right answer. I'm then frustrated because she doesn't understand my rationale for not going and the next thing you know we're on the "Crazy Cycle." To add fuel to the fire, I think she got even further upset at me when one of our neighbors called and offered to mow the yard. I thanked them but told them that I had planned on getting to it that day. I know..., that ol' pride thing rearing its ugly head again. On one hand, you know you should accept all the help you need but, on the other you feel like a waste because you're not accomplishing anything for yourself. So, needless to say while the kids had a great time at Dollywood, Patty and I didn't. Patty didn't because of me. I didn't because I was worrying about what I had to do at home. I've apologized. We talked things over afterwards as we usually due after any disagreement. We're off the cycle. Patty felt good enough to go to church as well. I was concerned again because I'm afraid she'll catch something. At Dollywood I had her and the kids applying hand-sanitizer after touching anything. Scott Sparks preached a great sermon on guilt and how Satan uses it as a motivator when we sin. While the Holy Spirit condemns sin but not us. We should be motivated by our love for God and to please Him not ourselves. So I was feeling guilty before but now I'm resisting, lol... Easier said than done. So, we come home from church on Sunday and........drum roll please.........the yard is mowed. I have to laugh. Patty is feeling better today. She has begun having trouble with her right arm again but she feels better than the past two days. Hopefully, she's coming back physcially from the chemo and neulasta shot. She'll go back Monday for her Herceptin infusion and to check her blood work. I don't think she has been out of the house since Tuesday so I'm sure that is wearing on her. When she got the Herceptin Tuesday I began thinking about her coming in to receive this for 52 weeks. That seems like a long time. It is a long time. You start wondering how long will it be before things begin to return to normal? Do they return to normal? Probably not. It's almost like running an extended marathon that goes by weeks rather than miles. Let's hope we get our second wind. I apologize for the lack of a update on Patty yesterday. Yesterday was just a whirlwind for me so I just didn't get time to do it. I sat down on the couch last night at 9:30 and basically fell out which if you know me you'll know that is unusual. Normally, I'm just really waking up at that time. Patty had a rough day yesterday. She basically stayed in the bed or on the couch all day. She says she feels like she has the worst case of the flu you could imagine. Thankfully, she hasn't had any nausea or vomiting on top of that. You can look at her and just tell she doesn't feel good. This morning before I left I asked her if she was feeling any better but she said she was about the same. Many thanks to Janine, Penny, Holly, and Laverne for coming and staying with the boys this week. I thank God that he is sending His people to help. From meals to babysitting to housework to whatever so many people have offered their assistance to us. I'll update again hopefully later this afternoon. Continue to pray that she will begin to feel better soon. Patty went back this morning to receive the Herceptin she wasn't able to get yesterday due to the allergic reaction. I sat with her again just in case she had a reaction to it. Thankfully, she didn't. She did ok last night but she started having stomach cramps later in the night. This morning she was feeling ok. She also had to get a Neulasta shot today to stimulate her white blood cells to produce more than normal since the Taxotere will wipe them out. The unfortunate side effect of this is bone pain. Tonight, she says her lower back and teeth are hurting. She also feels like she is totally wiped out. Luckily, she hasn't had any nausea so far. She also says she has a weird taste in her mouth along with a strange smell as well. Hopefully it won't get any worse over the next couple of days. Her spirits seem good. Continue to pray for her. I took Katie to her softball game tonight. It was ugly but she did well. I'm so proud of how well she has improved. She is having so much fun just being part of the team. That's just Katie. Even still, they lost 22-1. I've been there before. When I was a freshman and playing baseball for Fulton we got beat by Jefferson County 33-1. It was ugly as well. This was the first time I had been at a little league ball game since I played. That would have to be at least 20 years ago. Not much has changed. The concrete bleachers still hurt my backside, the brothers and sisters of the kids playing are running behind the stands with a crushed paper cut playing some type of ball whether it be baseball or football. The parents are still yelling encouragement to their kids and the kids are still yelling chants. Although, the girls versions are a little different then I remember. "We don't need no Barbie dolls, we just need bats and balls" just didn't ring a bell. As Katie and I walked to the car I watch her and observe from a different perspective what I must have felt at her age. I was reading a book tonight between innings when something I read jumped off the pages at me. The book was Blue Like Jazz by David Miller. Our pastor had used it as part of one of his recent sermons. Me, being the book junkie that I am, had to pick one up for some late night perusing. So I'm reading it and nothing earth shattering was standing out to me when all of sudden...Whomp, there it is. One of the best and true definitions of love I've ever read. At least for me. I'll paraphrase. When you don't love someone it is annoying when they tell you something to do or feel. When you do love someone you get pleasure from their pleasure. Wow, how simple of a description. As Steve Brown would say..."You think about that!" I forgot to mention in my last post that today was our baby boy's 2nd birthday. Patty feared the whole pregnancy that Brett would be born on 9/11. She didn't want him to be born on such a day of melancholy. I told her she was worrying about nothing as he wasn't due until 9/20. I was wrong, again. He was born on 9/11/04. It was fitting. Brett had been to the World Trade Center site while he was in his mother's belly. We embraced it as something to celebrate on this national day of remembrance. Although today, on Brett's second birthday, the celebration was muted. We hadn't had the time to plan him a party. I know Patty is saddened by this. She hasn't admitted it but I know. Especially knowing how much she loves her baby boy and how she enjoys planning special events for them. Patty shouldn't feel the full effects of the chemotherapy until 24 to 48 hours after it was infused. As I type her stomach has been really bothering her. Hopefully this will soon subside. So we now have another remembrance on this day. Patty's first cycle of chemotherapy. I pray that this will be something to celebrate in years to come. I’m sitting in a recliner normally reserved for chemo patients as I type this entry. I’ve spent the last 4 hours on a stool next to Patty in her chair. As the chemo suite emptied out, I finally had to move over to an empty chair next to her because my back couldn't take the stool any longer. It’s been an interesting morning. I should have known it would be this way when I hit the wrong button on the alarm clock at 6:00. Wrong day for that. I realized my mistake at 6:54. An hour later than our normal time to arise. Can you say frantic, express, rush attempt to get everybody ready and out the door for school? I can too; we rolled out at 7:14. 20 minutes, not to shabby. This meant that the back road route was in order since I had missed the 7:10 deadline to travel Emory Rd and make it on time. The back road route? A meandering route that roughly parallels Emory Rd. It takes us up Pelleaux (you just think you know how to pronounce it) and down Long Hollow, Brushy Valley, and then cuts up Cruze Rd to Clinton Highway where we then join back into our normal route. We made it with 5 minutes to spare. whew… (hand wiping forehead). Faye Neff graciously came over to watch the boys for us. Patty and I arrived at the cancer center at nine. Little did I know that there would be more panic to come. We checked in and they drew some blood work to have a baseline reference for Patty’s future blood work. They inserted the needle into Patty’s port and she said it wasn’t as bad as she was anticipating. They gave some preliminary drugs to help her with the chemo side effects such as nausea, allergic reactions, etc. The fun was yet to come. They begin to deliver the Taxotere first. It wasn’t long before Patty told me she felt something in her chest. I then turned around and her face was blood red and she was beginning to panic. She said her chest was getting tight and her face was almost completely red. I called for the nurse and they immediately ran over and disconnected the Taxotere and started pushing IV Benadryl and more steroids. They did their best to assure her it would be ok and shortly after her color begin to return and she started to calm down a wee tiny bit. For some reason, I was rather calm through the event but I became jittery after the fact. The doctor came over and checked her out and they decided to wait 30 minutes before they tried again. If she had another reaction she probably would not be able to receive Taxotere as part of her treatment. She would also have to take a different chemo drug that was not as effective as the Taxotere. This also meant she wouldn’t be able to receive the Herceptin until the main chemotherapy was completed thus prolonging her treatment course by another 3 months. So to say we were a little tense, especially Patty, when they restarted the chemo would be an understatement. The pucker factor was in the red, for me at least. It’s safe to say that we lifted up a few prayers during this short period. God graciously and mercifully answered them. They started her off with the slowest amount they could give and she seemed to tolerate that well. They then increased the amount every 30 minutes until they got it all infused at 3 p.m. They just now started the second drug, Cytoxan, a few minutes ago. Besides being a deadly chemical that is related to nitrogen mustard gas that has been used in chemical warfare and kills cells in your body with no regard, it’s a relatively less allergic drug. Let’s hope and pray the evening goes a little smoother. I’m drained and I haven’t even had chemo today. Pray for Patty. The next phase of Patty's Journey will begin on Monday at 9 a.m. She will begin her chemotherapy treatments then. You could really break this journey down to five stages. Diagnosis, Surgery, Chemotherapy, Radiation Therapy, and ultimately Survivorship. Cancer progression is broken down into staging as well. Diagnosis staging has 4 stages. With 1 being the best and 4 being the absolute worse. Stage 1 represents that the cancer was caught in its earliest stages and most likely will be cured. Stage 4 represents that the cancer has spread to other organs or systems in the body and the hope for cure is slim without intervention from the Lord. If you were wondering Patty's cancer was a Stage 2a. She continues to feel better but still has a lot of soreness. She's beginning her exercises to improve her range of motion. She's also driving now so she's gained back some of that freedom we all enjoy. So we're moving into Stage 3, chemotherapy. Its amazing its only been a month. From what I read most describe Stage 1,diagnosis, as the most agonizing. I concur. The first chemo treatment will last 4.5 hours. Patty about croaked when I told her. She can't imagine sitting in a chair that long. She really won't feel the full effects of the treatment until day 2 and 3 after the treatment. Hair loss usually kicks in about 2 weeks after the treatment. Please pray that she will tolerate the treatment well and have minimal side effects. Also that she will cope well with the whole hair loss issue. By the way, she's beginning to feel better just still a lot of soreness. Sorry for the belated update. Patty went for a checkup with the surgical oncologist today. He said she was healing well and gave her some information on improving her range of motion. He also said that the burning sensation in her arm was a good sign as it meant the nerves were damaged but not cut in that area. She still will probably never recover feeling in some areas of her upper arm and axilla. So it looks as if the chemo will start next week on Monday or Thursday. Patty hasn't decided yet which day she wants to start. Brett's birthday is on Monday so I'm not sure if she wants to start on that day. She will be taking a new chemotherapy regimen that just this year begin replacing the gold standard of Adriamyicin/Cytoxan which had been used for decades. Adriamyicin is an effective drug but has a 1% chance of causing severe heart toxicity. The new regimen of Taxotere/Cytoxan demonstrated in clinical trials improvement in disease free survival and overall survival without the heart toxicity associated with Adriamyicin. Additionally, it is much better tolerated than Adriamyicin. The only drawback is an increased risk of neutropenia. Neutropenia is a low white blood cell count which makes the person much more susceptible to infections normally handled by a healthy immune system. Patty will have to be extra careful to not be around anyone with something as simple as the common cold. Please pray that Patty will tolerate the treatment well and that the treatment will heal her body. Yesterday was a little bit of a..., for the lack of a more eloquent term, down day for both of us. Patty didn't feel too hot and when the girls got home the kids starting getting a little rowdy which, when you don't feel good only makes things worse. Of course, sometimes Patty's mood affects my mood and then it goes down hill from there. Talking to her today her spirits seemed better. She is still having the itching issue and her arm is still bothering her but doing better overall. I'm still languishing today for some reason. As you can imagine I've been pouring myself into breast cancer information, data, and research over the last few weeks. It seems the more I do the more defeated I become. Not because of any possible future negative outcome but, because when I read the odds of Patty getting this at the age she did after all the preventive measures we took, it is like we hit the reverse Powerball. OK, maybe I'm overexaggerating, how about the reverse Pick Five? It could be worse. Patty had always told me she was going to get breast cancer. Me, ever the encourager, told her she was being fatalistic and explained to her that her odds were not that great of developing it. I work in the field, trust me, I'd say. Me, ever the researcher, had tabulated her odds many times with online programs that calculated her risk. Even those showed a low chance of development. Me, the Believer, had prayed for years that she wouldn't develop this disease. I was wrong. I was more wrong than I ever imagined. I know I didn't let her down but it sure feels like it. I fear now that in her mind I have lost credibility. She would never tell me if it were true. Ironically, this happened before. Back in 1992, Patty's mother was diagnosed with recurrent breast cancer that presented in her bones. I had just started in the field of Oncology. Me, ever the encourager, told Patty that many women that have metastatic disease in the bones still can live several years. And often they do. She died a few months later. Once again, credibility shot. Even before now, when I would give her encouraging news about breast cancer prevention and treatment, she would remind me of my previous encouraging comments. Can you tell I haven't been in the Word today? I can. I think I'll do that now. Patty is doing good today although she strained her arm last night when she stumbled over a break in the driveway at Darrell & Beth's house. I should have asked Darrell if he had good homeowner's insurance, lol... She was real uncomfortable last night and still today. The numbness in her arm still is bothersome as well. She is still unable to sleep on her side because of the arm issues. While researching Bible studies for our community group I came across this online video lesson of which I could definitely relate - the dimmer periods of life. It is appropriately titled RAIN. It is authored and presented by Rob Bell, founding pastor of fast growing Mars Hill Bible Church. Bell is not without controversy. There are many in the Christian community that disagree with his viewpoints on Christ and the Bible. But it seems there is controversy about anyone that pens a Christian book today. On this subject, the video is well done and thought provoking. If you have the time, click HERE and watch the video. Its about 11 minutes long. I might use this in our community group this Fall. Patty is continuing to feel better each day. She is still having trouble with her arm. She says it feels like its burning, almost like a bad sunburn. Hopefully that will ease off. She is scheduled to the see the surgeon on Thursday and they'll schedule the chemo to start for probably next week. We're enjoying the rainy day today. We're all piled up on the couches and watching Anne of Green Gables on loan from the Anders. Angie and baby are doing well. Patty felt well enough to go to church today which really surprised me. I think she is starting to get cabin fever. She went to Wal-Mart yesterday for first time in weeks which is a new world record for her. Although when she got back she was wiped out and had to take a nap. I was jealous. We have a nuisance that is plaguing her today, itching. Where the scars are healing it is driving her crazy. Hopefully, that will cease soon. She says it hurts too bad to scratch, so she has to endure the itching until we can find something on a holiday weekend to relieve it. As I was sitting in church today, thankful that my bride of twelve years was next to me, something came over me as we were worshipping and listening to the sermon. All you can think about when you discover that yourself or a family member has cancer is how devastating it is to your life, your way of life, your plans, your everything. But after wading through this for almost a month now I've discovered that there is indeed at least one silver lining, a gift per se, that cancer brings as it sneaks up on you like the opposite of a surprise birthday party. A gift you say? How could cancer bring a gift that someone would want? I know, sounds crazy doesn't it? It's a gift that those of you who haven't had to face the possibility of death haven't experienced - yet. A few may think they have the gift beforehand, I thought I did. But, I didn't. The gift is Appreciation, ...Appreciation of LIFE, ...in its simplest form, ...the way it was created and intended to be by the God of the Universe, King of Kings, Lord of Lords, the great I AM. It is an outright shame that it takes something tragic for you to receive it but nevertheless, that is the way for most of us it has to be. Things slow down when your life is interrupted. Matter of fact, for a few weeks they grind to a halt. But for me, the sweet lubrication of the Lord, His Word, His followers, and family have caused the gears of my life to begin to turn again ever so gradually. And now, as my eyes slowly reopen, the world looks a little bit different. Things that were previously taken for granted are no longer. A wonderful wife, no way. And, things that may have seemed to had greater importance just a few short weeks ago no longer do. In this short time, I'm already a better husband, parent, and Believer. Hard to imagine it came from all of this. I can only hope and pray it will last. Patty got the final drain removed yesterday. She said it wasn't as painful as the first two. But, of course, this time she has prepared herself by taking some pain medicine. She slept better last night but not as restful as we hoped. Evidently, the place on her right side where the drain was is still tender and sore. I think she is getting used to having to sleep on her back. Patty's aunt is still here. She cleaned the house for us and of course you know Patty had to try to help clean the playroom. She will see the surgeon next Thursday to check for healing and probably start the chemo the first of the following week. Truthfully, we've not thought to much about it. As of late, we've only been thinking of the day at hand. Believe or not, I didn't even know what time the first UT football game was until I found out last night. That's like heresy here in Big Orange Country. I hear Patty now drying her hair so she is attempting to do some things with her arms which is good. Hopefully, she'll continue to improve and feel much better before the chemo starts. Continue to pray for her healing, physically and mentally. Patty's story is getting out. 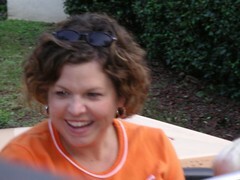 The well known blog, "the Cancer Blog" has posted an article on Patty, her story, and our blog. Click HERE to read the story. The author, Jacki Donaldson, a breast cancer survivor who just finished her treatments for breast cancer a few months ago, also blogged of her cancer treatment experience at http://www.jackidonaldson.com. Her case was similar to Patty's. Young, 34, two beautiful boys, and breast cancer at an early age. Her blog has given us a view into the future of Patty's treatment. Thanks for sharing your experience Jacki. Patty is a 38 year old wonderful wife and mother of 4 beautiful children (10,7,5,4). She was diagnosed with breast cancer on August 9, 2006.